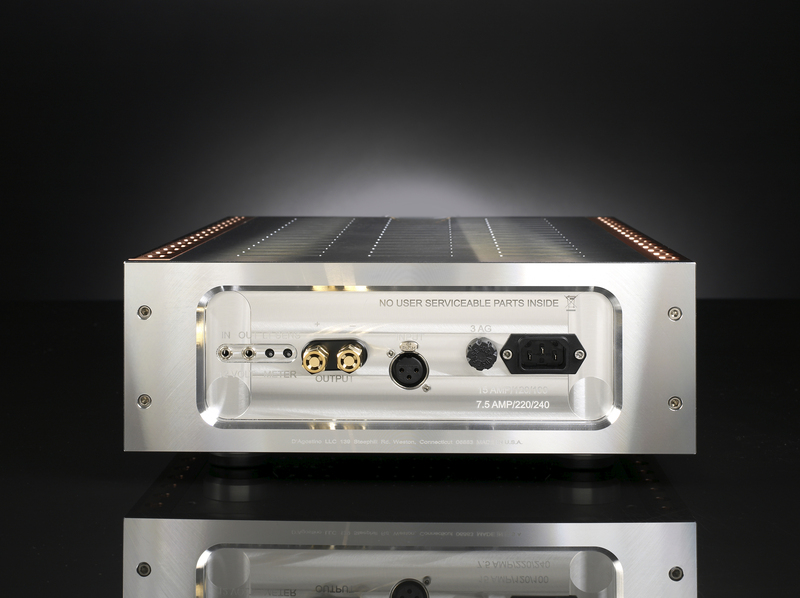 The Momentum monoblock ampliﬁer is the ultimate expression of legendary audio designer Dan D’Agostino’s passion for music. It delivers an incredible 300 watts into 8 ohms, but thanks to its highly efficient copper heat sinks with cooling venturis, the chassis is just 5 inches high and consumes less than 1 watt of power at idle. Fully complementary, balanced circuit topology using 1% metal-film resistors and 69 MHz output transistors allows ultra-low noise and bandwidth exceeding 200 kHz. A distinctive meter, inspired by the styling of fine Swiss watches and bearing D’Agostino’s signature, allows monitoring of power output. 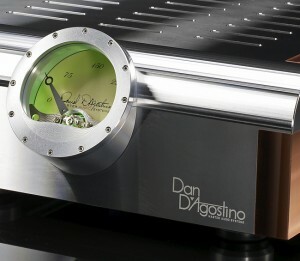 Each Momentum monoblock amplifier is hand-built and individually tested in D’Agostino’s Arizona factory. Rugged throughhole construction allows the use of higher-quality components, thus assuring superior performance for years to come. Revolutionary Cooling. 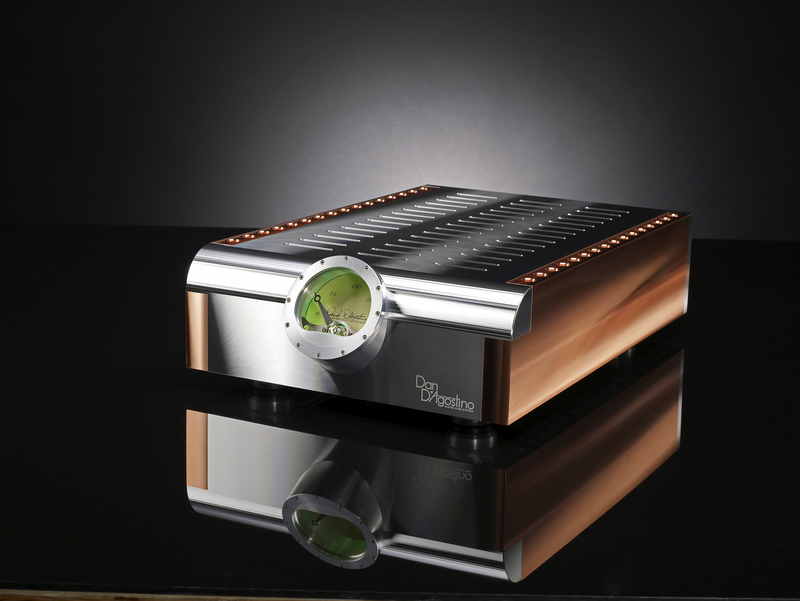 The Momentum is the first production amplifier to use copper for its heat sinks. The thermal conductivity of copper is 91-percent greater than that of aluminum, allowing the Momentum to use a much smaller heat sink. To further enhance cooling capacity, the heat sink uses venturis instead of fins. The mouths of the venturis measure 0.75 in (1.9 cm), and they narrow to 0.5 in (1.2 cm) in the middle. As the air in the top of the venturi heats and expands, the shape of the venturi forces it upward and draws more air in from the bottom. The venturi-equipped copper heat sinks make the Momentum’s compact, four-inch-high chassis possible. Energy-Efficient Design. Most high-end audio amplifiers consume hundreds of watts of power the moment you push the “On” button—even when they’re idling and reproducing nothing but silence. With the Momentum amplifier, Dan D’Agostino has achieved a new standard in energy efficiency for the high-end audio industry. Despite its impressive output of 300 watts per channel into 8 ohms, the Momentum draws less than 1 watt of power at idle—or about one fifth of what a typical cell phone charger might require. High-Speed Transistors. The 28 output transistors used on the Momentum are among the fastest high-output transistors available. They run at a blistering 69 MHz, permitting D’Agostino to achieve incredible bandwidth. Each transistor mounts with two stainless steel fasteners—a rarity among flat-package transistors—for maximum thermal transfer to the copper heat sinks. A capacitor/resistor network connected to the base of each transistor ensures stability even at high frequencies and with low-impedance speakers. A Build-Quality Benchmark. Hand-built and hand-tested in America, the Momentum’s chassis is machined from solid aluminum billet, not stamped from sheet metal. It is non-resonant and provides superior shielding from radio-frequency and electromagnetic interference (RFI/EMI). The circuit board is assembled using through-hole construction, which resists heat (and stands the test of time) far better than the usual surface-mount boards can. Using through-hole construction also allows the use of higher-quality capacitors in the circuit. All resistors are 1% metal-film units. There are no capacitors in the signal path—the amplifier is DC-coupled from input to output. 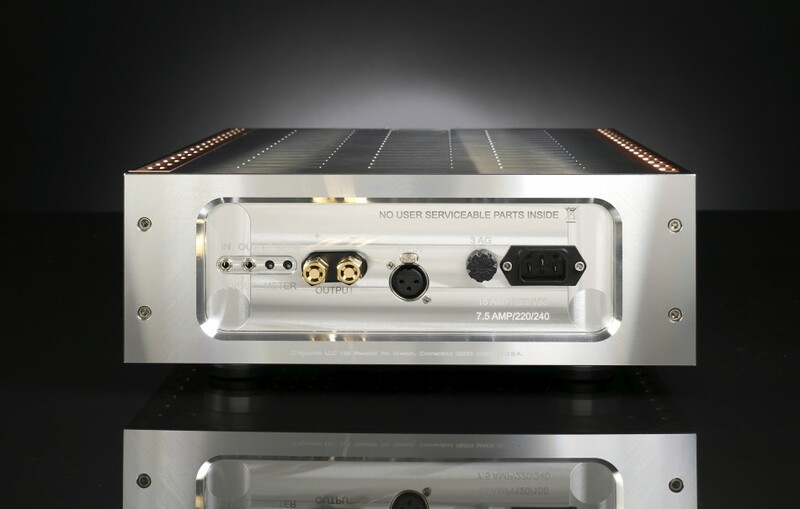 The Momentum Amplifier Stand is designed specifically for use with the Momentum Monoblock and Momentum Stereo amplifiers. This stand elevates the amplifiers above rugs and carpeting, assuring proper ventilation. By elevating the amplifier a few inches above the surface below, the stand helps keep dust and debris away from the amplifier’s vents. The conical, solid aluminum feet help isolate the amplifier from vibration coming through the floor, so its circuits will be unaffected by these vibrations.